The impressive Logical One by Romain Gauthier features a triple patent-pending flat chain-and-fusee style constant force system with ruby chain links, ergonomic push button winding system, dial-side visible balance, mainspring barrel with sapphire inserts, plus a 60-hour power reserve indicator. The vast majority of machines run on constant force: Cars and planes don’t start running slower as fuel runs low and machines receive the same voltage no matter how much electricity is produced. 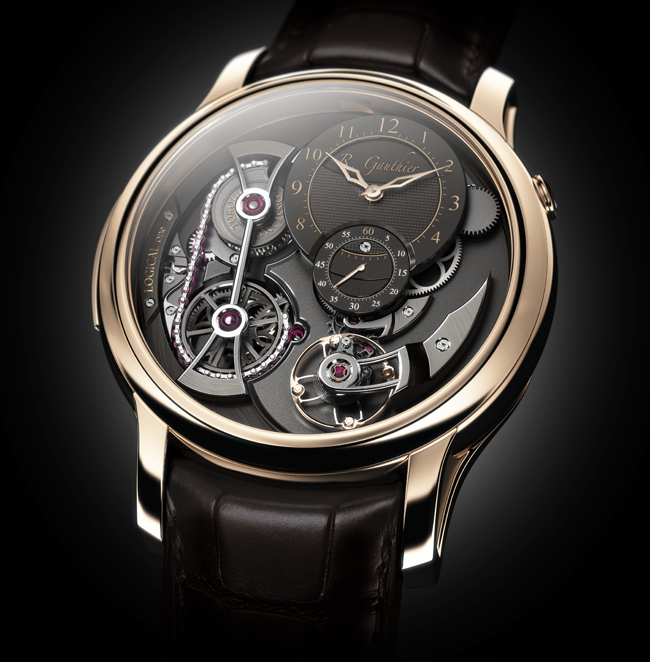 Differently, the power that runs and regulates the vast majority of high precision mechanical timepieces varies greatly according to the state of wind of the mainspring. 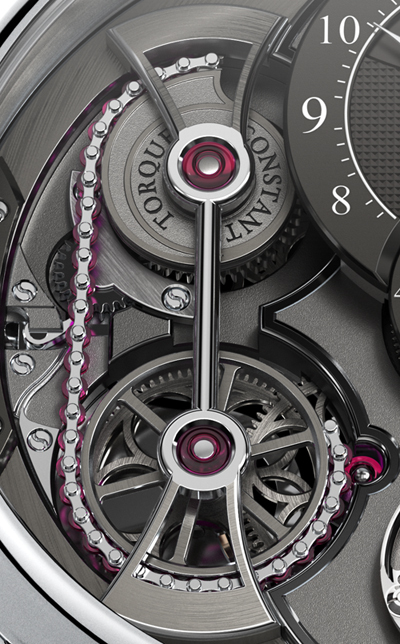 Constant force is one of the holy grails of horology and with Logical One, Romain Gauthier has reinvented the chain-and-fusee − one of the oldest and most traditional methods of supplying constant force to a watch/clock movement − making it both more reliable, more effective and more constant. Actually, Romain Gauthier replaced the fusee with a slowly rotating snail cam, which is situated at 10 o’clock to the left of the hour/minutes dial. As the snail cam and mainspring barrel are on the same level, the force is always transmitted in a straight line and, as only one short line of chain is needed, the links can be bigger and stronger. 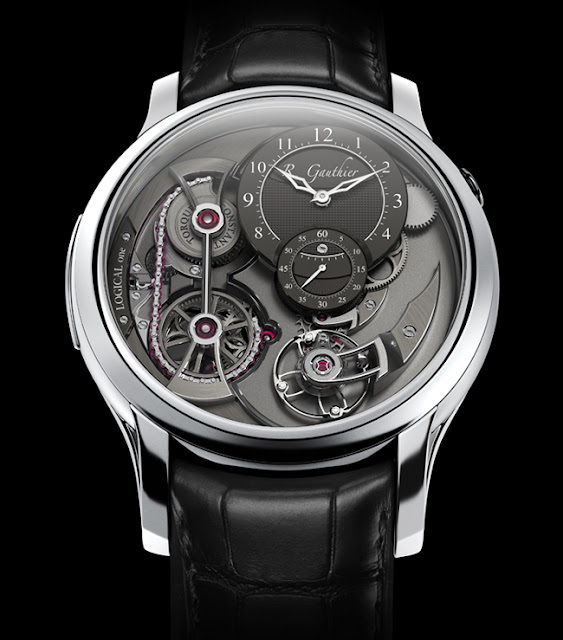 This allowed Romain Gauthier to make the chain links in low-friction hard-wearing synthetic rubies. 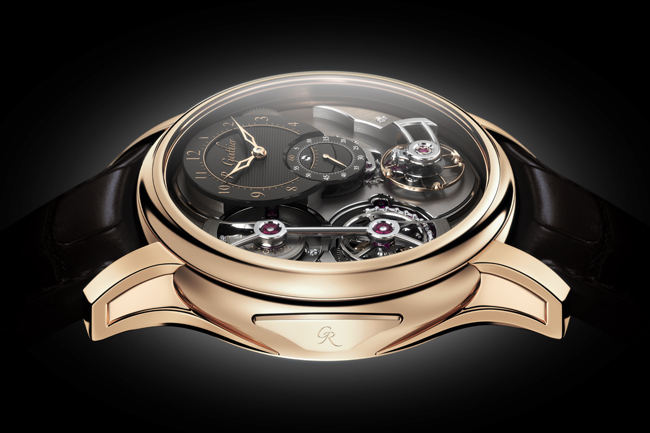 Winding the Logical One is a pleasure thanks to Romain Gauthier’s innovative push button winding system, with the pusher set neatly into the left case band. While the push-to-wind system is a pleasure to use, its advantages are not only ergonomic and aesthetic, but based on sound engineering principles. A traditional crown is relative small with a fine (relatively fragile) stem that has to transmit the force 90° between the crown to the mainspring barrel. The pusher to wind Logical One transmits force to the barrel on the same plane. 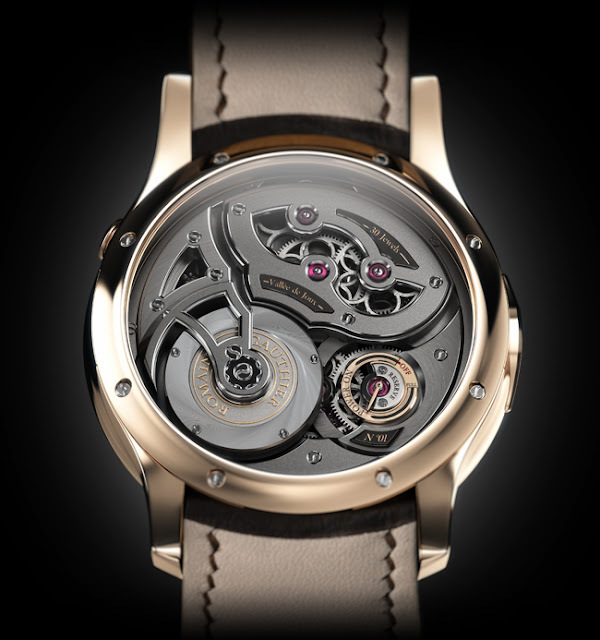 The Logical One movement, whose plates and bridges are made of titanium, steel and brass, was entirely conceived, developed, designed, produced, decorated, assembled and regulated by Manufacture Romain Gauthier. 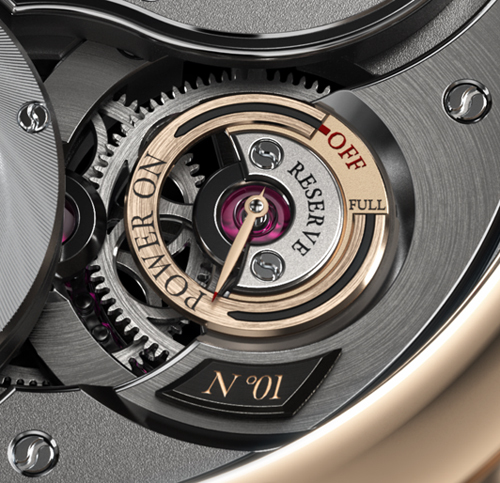 The 43 mm case - water resistant to 50 metres - is available in red gold or platinum.